Easter is less than five weeks away. What do your preparations look like for Easter? Last year I was determined to not let the biggest and greatest event of the Christian calendar get relegated behind Christmas in terms of significance. Therefore, we put some important times in place that hopefully we will repeat again this year for it to begin a tradition in our family. In the week leading up to Easter, we celebrated the Passover as a family. We used the resource from Jennifer Dukeslee (http://jenniferdukeslee.com/a-messianic-passover-seder-for-families-with-children/ ) Google and find an outline that would best suit you and your family and their ages. This one worked really well for us, apart from this year we will time the ending of cooking the lamb roast until an hour after we start the celebration so as to keep it warm. Matey (then aged 8) thoroughly enjoyed it and loved the symbolism and has requested it several times since. The Good Friday March in our local town that incorporates the stations of the cross will also be something we prioritise this year. Unfortunately it was rained out last year, but walking around in the pouring rain, we got a glimpse of what we could expect this year and it is good. It is a fantastic way for the kids to experience the Easter story and what it means and how to apply it to their lives. The “Resurrection Eggs” remain a favourite that we bring out every year. These are obtained from a Christian book seller, Amazon (~$20) or you could make it yourself. You could even list the items and have the kids source them out for you. 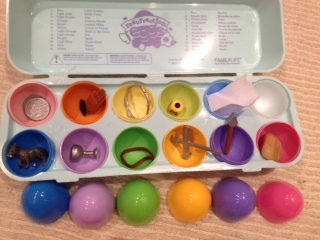 Basically there is a dozen plastic eggs and inside each egg is a symbol from the story of Jesus’ death & resurrection. These symbols are a little donkey, silver coins, a cup, praying hands, leather whip, crown of thorns, nail, dice, spear, cloth and stone with the last one empty to signify the empty tomb. My kids absolutely love this hands on aspect to the Easter story and Matey in particular will spend hours playing with it and telling himself the Easter story. An Easter Scavenger Hunt is a similar idea. The list has ten objects to find, and the kids then share what each object represents. Something sharp (Jesus’ pain), something prickly or thorny (the crown of thorns), something made of wood (the cross), something dead (Jesus’ death), something dark in colour (the darkness that came over the world after his death), something round and smooth (the stone placed in front of the tomb), something soft (the cloth that Mary found in the tomb on Easter morning), something living (Christ’s resurrection), something colourful (our hope and joy that comes through Christ sacrifice on the cross), something light in colour (Jesus is the light of the world). Creating a “Resurrection Garden”. Making a garden on a plate to signify the scene of the cross, the cave with the stone rolled away etc. Google for ideas. In the lead up, I am going to have some chocolate surprises for the kids and relate them to surprises from God. I want to inject more fun and laughter into our home. Treasure hunts, fun decorating with dry branches and wooden painted eggs, taking it in turns making up stories about the people who witnessed Jesus’ last days on earth etc. My kids love cooking so that is also a feature of this time. Resurrection buns (google for a recipe) are easy to make for kids of all ages. We will also try baking hot cross buns this year. Princess (11) can google new Easter recipes and Matey (9) and her can surprise me by cooking them. I also like the idea of cooking things with a surprise inside and then applying the principle of ‘don’t just look at the outside but it’s the inside that counts’ principle to everyday life. This year I am also going to try some new Easter art projects. There is a great string art wooden cross project at “wearethatfamily.com” that I am going to try with the kids. Also I am getting a blank canvas and letting them paint what Easter means to them on it. Kingdom values of generosity and giving, forgiveness, acceptance and hospitality are going to be explored more fully in our family this Easter and we are planning on brainstorming how we can really implement these values into our life. I also want to visit a local neighbourhood church as they hold special ‘Holy Week’ services that are meaningful and add a different dimension to what our children normally experience. What are your plans for celebrating Easter with your family? I would love to hear them and perhaps incorporate them into our family next year. Thanks.